Our Quality Commitment - Anchor Industries, Inc. In today’s hyper-competitive market, having the right product mix and availability to address every potential sale is critical to obtaining new business and helping to preserve your bottom line. At Anchor Industries, we understand the importance of product availability. 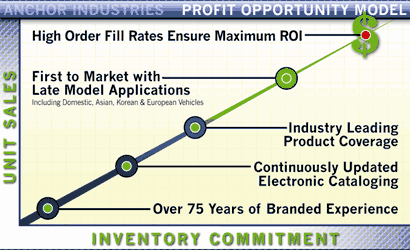 That’s why we go well beyond the traditional popular product sales mix and work hard to ensure we are a first-to-market supplier on late model applications for all vehicles, including domestic and import applications. Complement our inventory commitment with superior customer service support and you have a winning formula that will help increase your profit opportunities. How Anchor can help you grow your sales!